There’s chemistry everywhere, all the time. We’re made from chemical compounds and everything that happens in our bodies, even our thoughts, is a chemical process. The Chemistry Lab is where we explore the magic of chemistry. Welcome to the Chemistry Lab! The Chemistry Lab is open every day, all year round. We’ve got room for 32 budding scientists at the same time. Bag your place by taking a ticket from the board outside the lab. You can see what time our lab sessions start on the screen outside the lab and in the programme. The lab is open to the public between 2.30 and 5.30 p.m. on weekdays and between 10.30 a.m. and 5.30 p.m. at weekends and in holidays. The Chemistry Lab is included in your entry fee. You don’t have to pay anything extra to join in our Lab sessions. The Chemistry Lab has a minimum admission age of 3. Children aged 3–9 are welcome if accompanied by an adult. The lab is open for school visits during the morning during school terms, 32 weeks of the year. Step into a fascinating world of chemistry! 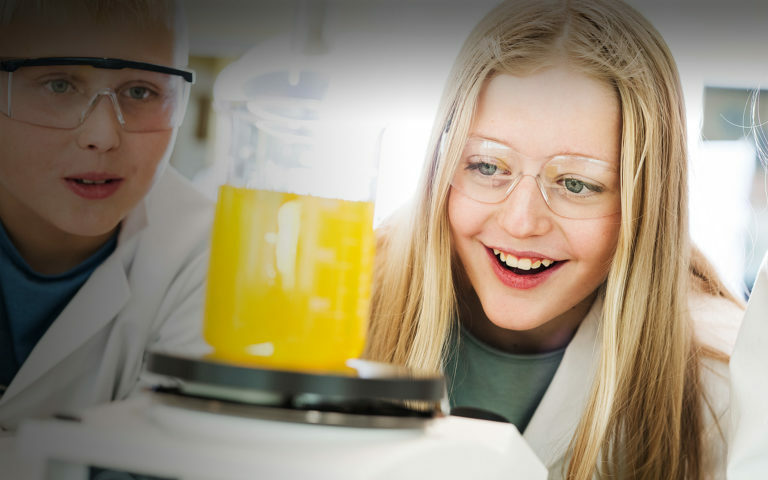 Every hour our guides show you how just exciting chemistry is with a lively lab session. Then come into the lab and experiment for yourself as you play with amazingly awesome chemical reactions. Lab sessions run every day and you’ll find the times in the programme. Tickets are released 15 minutes before the start of each session and can be collected from the board outside The Chemistry Lab. Everything is chemistry. Honest! You, for example, are 100% chemicals. Just reading this text about chemistry sets off loads of chemical processes in your body involving different kinds of chemicals. This is where we get to discover some of the fabulous and fantastic things about chemistry! In your stomach, stomach acid is breaking down the food you just ate. In your cells, energy-packed reactions are taking place to transform the oxygen you breathe in into water, and the carbohydrates you eat into carbon dioxide that you breathe out. And in your brain, your brain cells are constantly exchanging chemical compounds. That’s what makes your thoughts, memories and feelings – everything that makes you you. The air we breathe mainly consists of two elements – oxygen and nitrogen. Oxygen makes up about 21% of the air and nitrogen makes up 78%. The remaining percentage consists of carbon dioxide (CO2), methane (CO4), steam, which is water, (H20) and the noble gas argon (Ar). We wash our hands with soap to make them clean but why? Soap contains sodium salts that lower the surface tension of the water and emulsify the grease that the dirt is often sitting in. Emulsify means that the grease is broken down into tiny weeny fat particles that are enclosed in the sodium salt and can then be rinsed away. Why does fish last longer if you salt it? Why does meat change colour from red to brown when you fry it? And how does baking powder make cakes rise? As you might have guessed, the answer is chemistry! All cooking is about changing the chemistry of an ingredient. You have probably seen a rusty car. But have you ever thought why it went rusty? Rust is the result of a chemical process called corrosion, where iron has reacted with the oxygen and water in the air. The reaction is faster when there is more moisture in the air, which is quite common, especially here by the sea on the Swedish West Coast. If salt water is involved, iron goes rusty even quicker. But chemistry helps us to clean the water, easily, cheaply and safely! Polyethersulfone is a type of polymer, or plastic, made chemically to be used to treat water. The plastic has properties that mean we can manufacture membranes with incredibly tiny pores. These membranes are used in the product LifeStraw, where the active polymer was produced by our Universeum partner BASF. A single LifeStraw can clean an amazing 18,000 litres of water. Other materials produced chemically include insulation for eco-friendly homes, biodegradable plastic that doesn’t harm the planet, lightweight materials for the vehicles industry that reduce carbon emissions, and loads more too. Substances can be acidic, neutral or alkaline. Acidity is measured on a scale called pH. In the middle of the scale we find neutral substances, like tap water. It has a pH of 7. At home in the kitchen you can find lots of examples of acidic and alkaline substances. Lemon, yoghurt and vinegar are acidic and all have a pH below 7. What determines whether a substance is an acid or an alkali is the amount of positive hydrogen ions, protons, in the solution. The more hydrogen ions, the lower the pH. Positive hydrogen ions are very important for all living things. This is why the natural world is very sensitive to changes in pH. The amount of carbon dioxide in the atmosphere is increasing. When carbon dioxide is dissolved in sea water, it forms carbonic acid, which results in the pH falling and the sea becoming more acidic. Many ocean organisms such as coralline algae, sea snails and crabs have shells made from calcium carbonate. When calcium carbonate comes into contact with more acidic surroundings, it becomes porous and finally dissolves. This is a problem if you happen to be made from it. You can test how an acidic environment affects something made from calcium carbonate. Put a raw egg in its shell in vinegar overnight. What happens?